I’m no different than everyone else I know. I overate between Thanksgiving and New Years. I put on a few pounds. I have to get back to some kind of normal. But I’d rather not feel deprived. I like eating well. I also hate to waste food. 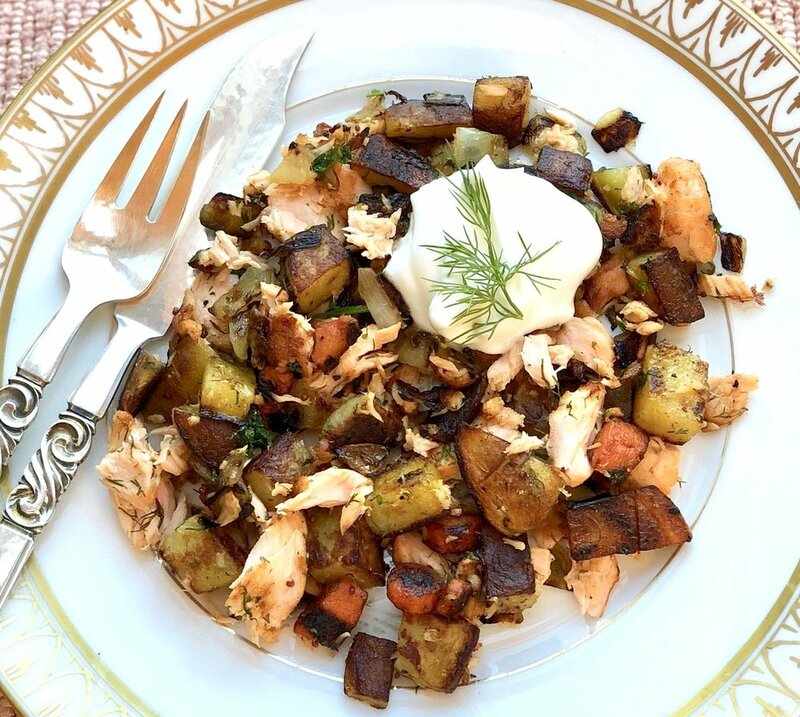 Hence: dinner items such as this Salmon Hash. From the (healthy) salmon we eat for dinner one night, together with some vegetables and fresh herbs. Bits and pieces and leftovers and what-have-you that tastes terrific and uses up the leftovers. Couldn’t be better. Top this hash with an egg or with dairy sour cream or non-fat Greek style yogurt. Serve it is some lovely plates and it becomes all elegant. My daughters are not big meat eaters, so when they were young kids and still living at home, I never made stuff like roast beef or beef stew or meatloaf. They just didn't want any of it. They didn't even eat hamburgers. We were basically a chicken and turkey family (including chicken and turkey burgers). Also, I would make burgers out of all the vegetables I used for chicken soup, which I cooked more often than almost everything. That was a kid favorite. They still talk about those burgers. Recently I made some chicken soup because, well, it's been rainy and gloomy in my part of the world and soup is like magic to help get you in a good mood. I used the leftover vegetables for burgers, just for the two of us. Fabulous not-quite-meatless dinner. Of course you can make this a vegetarian meal with regular cooked vegetables not from soup! Place the cooked vegetables and dill in a food processor and pulse to combine them and chop them into very fine pieces. Spoon the contents into a bowl. Add the egg, matzo meal and some salt and pepper to taste. Mix thoroughly to combine the ingredients evenly. Shape portions of the mixture into patties about 1/2-inch thick. Heat about 1/4-inch vegetable oil in a saute pan over medium-high heat. When the oil is hot enough to make a crumb sizzle, add the patties, a few at a time, leaving space between them in the pan. Do not crowd the pan. Fry the patties for about 3 minutes per side or until golden brown and crispy. Drain on paper towels. How Many Servings Was That? Last night my sister-in-law Eileen and brother Jeff were supposed to come over for dinner and watch the Oscar show with us, but she has a cold and needed to stay put at home. I had already prepared dinner -- breaded some turkey cutlets, cleaned some string beans, mixed the batter for vegetable fritters and fried them to a crisp. Ed came in to the kitchen and sampled a hot fritter fresh from the pan and declared it fabulous. About a minute later he came back for two more. 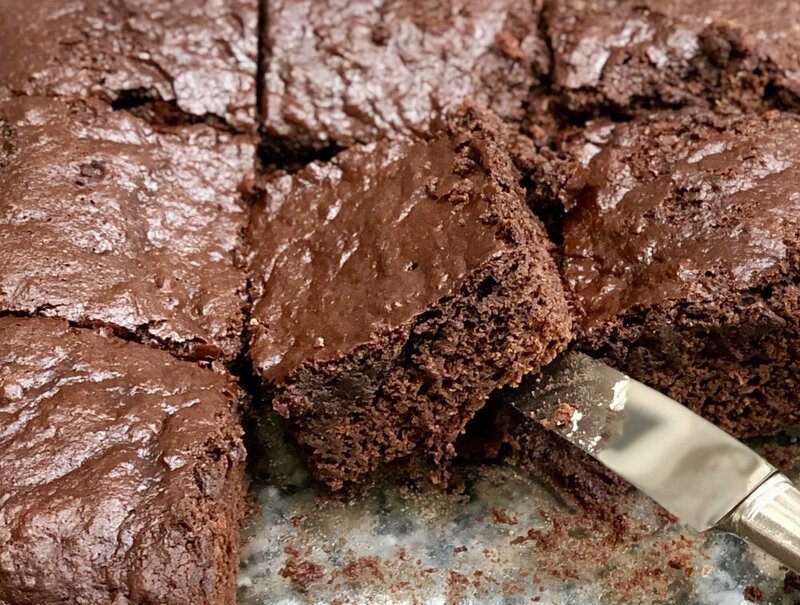 The recipe makes about 10 pieces, (serves 4-5 people) and now there would only be the two of us to eat the remaining 7. Mix the flour, baking powder, salt and sugar in a medium bowl. In another bowl, beat the egg, stock and olive oil. Pour the egg mixture into the bowl with the dry ingredients and stir until smooth. Fold in the vegetables. Heat about 1/8-inch vegetable oil in a large sauté pan over medium-high heat. Pour about 1/4-cup of the batter into the pan for each fritter, leaving about 1-inch space between the pieces. Cook for about 2 minutes per side or until browned and crispy. Do not crowd the pan. Repeat with remaining batter. Drain the fritters on paper towels.